I hope this Monday has been a good one for you. I've accomplished a lot today (good thing), however it hasn't been craft related (not such a good thing). My Bunco group will be meeting at my house this week, so I'm tearing apart and cleaning things that probably haven't been cleaned since we met at my house this time last year! * The labels are cut using the Cricut cartridge "Artiste", then stamped with the "Magic Potions" stamp set from "Close To My Heart"
* I used lots of Crinkle Ribbon from "My Craft Spot" and twine from "Trendy Twine"
* I filled some of the jars with Skittles and some with Reece's Pieces...yummy! So...can you keep a secret? All my Bunco buddies will get to take one of these cuties home with them after our game! Now you know why I made so many! Guess it's time to get back to work. I'll be checking in through the day tomorrow and doing some blog visits....hey ....a girl has to have a break from cleaning every now and then! Omgoodness! 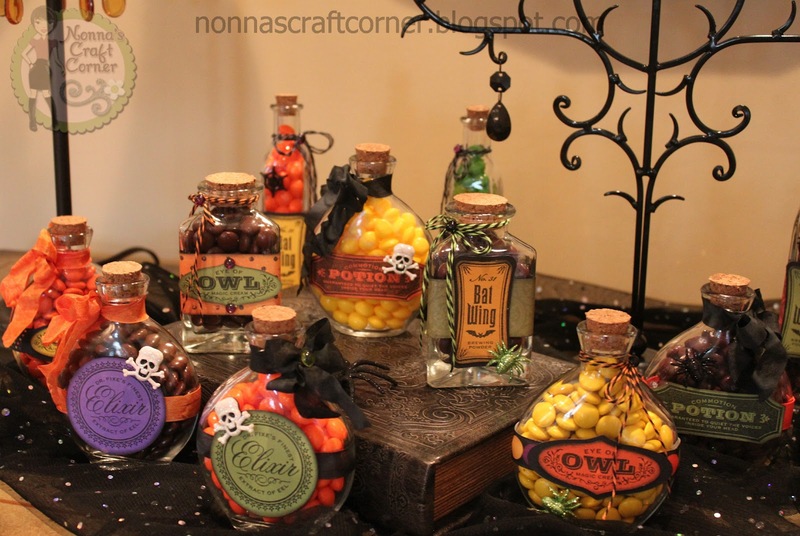 I just love all your Halloween potions! They turned out awesome!! The twine and crinkle ribbon look great and I just love those Close to my Heart stamps!! Love it!!! LOVE! These are absolutely awesome! What perfect gifts and I love the twine and ribbon! So very cute! This really makes me want that cartridge! 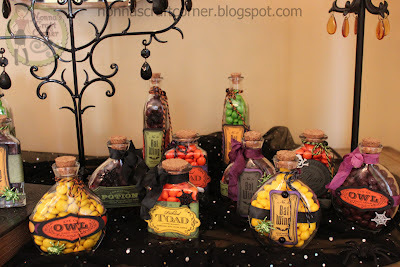 i love all the potion jars....great job. have to keep my eye open for some cute bottles. Wow, those are so adorable! What a fun way to decorate, love the accent of Trendy Twine too! Great idea they are beautiful. I will take a potion of Reece's please. Holy smokes....I love this idea!!! I love the cute little jars and oh...let me see...the skittles, my favorite!! Wish I could reach thru the screen and get me some, lol!!! Very cute and inspirational Tanya:) TFS!!! These are cool! Are you picking me up at the airport?? I just learned to play bunco! OMgosh this looks awesome. I wanna come over your house on halloween. those are soooo awesome, Tanya!!! LOVE this idea!!! WOW, these are so fabulous!! What a festive and fun display!! I just love them...great idea!! Oh my!!! Love this idea. These are fantastic! A fun and festive way to decorate and sweet little treats too. Thanks so much for the touch of Trendy Twine. Super cute idea!!! AWESOME JOB! Totally love all of them, awesome job!! 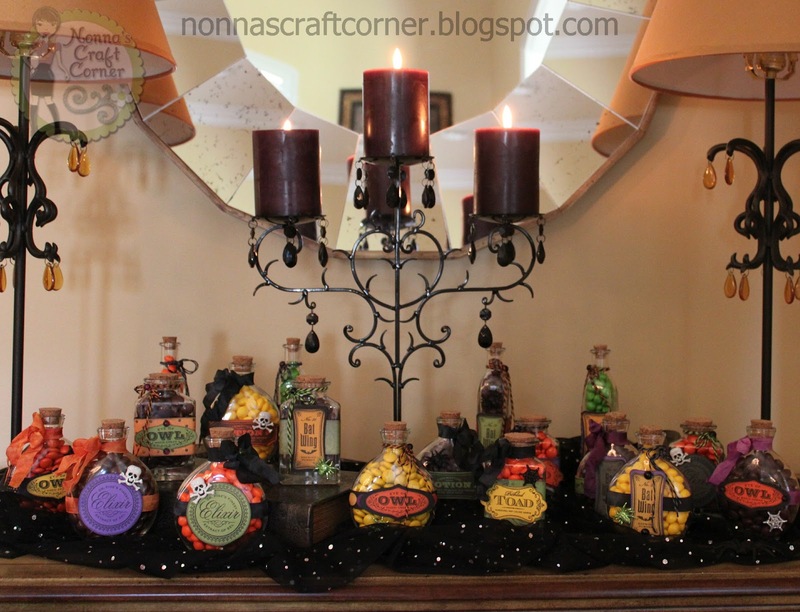 These look fabulous Tanya.I love these potion stamps and got mine out to play with today!Just had to tidy my craft room first!!! Tanya, these are fabulous! You have inspired me to hit Michaels up and make some of these cute bottles, but only if there on sale:)lol. 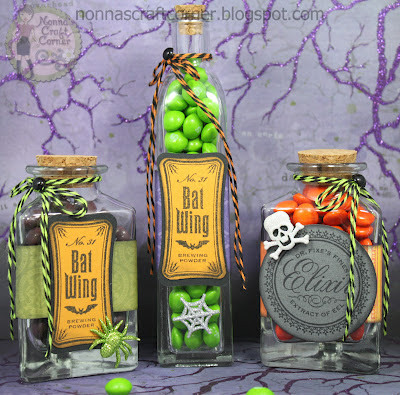 Your friends will love their cute little halloween bottels. These are awesome. 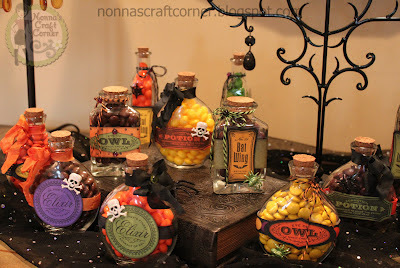 Perfect party decor and great twine colors you picked. Your friends will be so happy to get them. Tanya ~ OMG!!! I LVOE these and will take them all along with the furniture and accessories too! Actually from the last post ~ I will just move in! 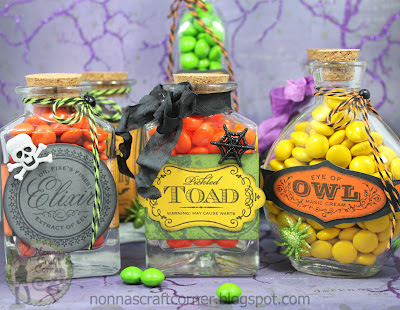 Your home is BEAUTIFUL and so well decorated in general and for the up coming Halloween!! LOVE these to pieces ~! all of them!! I love these little jars! They are too cute!!!! Looks like I need to learn how to play bunco ;) O my gosh Tanya.... These are too awesome! Love, love, love, your beautiful work, as always.